With over 20 years experience our friendly, reliable and approachable staff will work with you to design your own style and achieve the best solution for your windows. 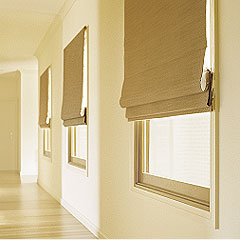 All our blind and curtain products are custom made to your requirements ensuring you'll have a perfect outcome every time. Whether your are looking for simple ideas to refresh your existing interior or furnishing your brand new home or office, we offer professional advice, together with a high standard of workmanship and quality of product. View some examples in the Gallery.